We find that approximately a quarter of the world’s productive capital could be sensitive to climate; therefore, this capital faces the risk of accelerated obsolescence in a world warming by an average of 0.2 °C per decade. We examine the question of optimal adaptation to climate change in a vintage capital growth model without uncertainty. Along the optimal pathway, adaptation is proactive with an anticipation period of approximately twenty years. 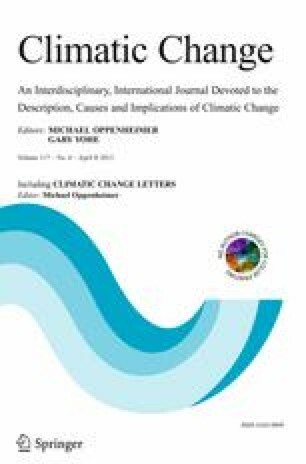 While there is additional investment in this scenario compared with a no-climate-change baseline, the overall cost to adapt is low relative to the potential losses from maladaptation. Over-investment in protection capital allows the economy to be consistently well-adapted to climate; thus, such a policy prevents transient maladaptation costs. Sensitivity analysis with an integrated assessment model suggests that costs could be ten times larger if adaptation only begins after vulnerable sectors are impacted. We acknowledge financial support from the Ile de France region under the R2DS research programme and from the ANR research project AMTools. We would like to thank S. Hallegatte, C. Böhringer, EAERE participants and two anonymous reviewers for their useful comments.